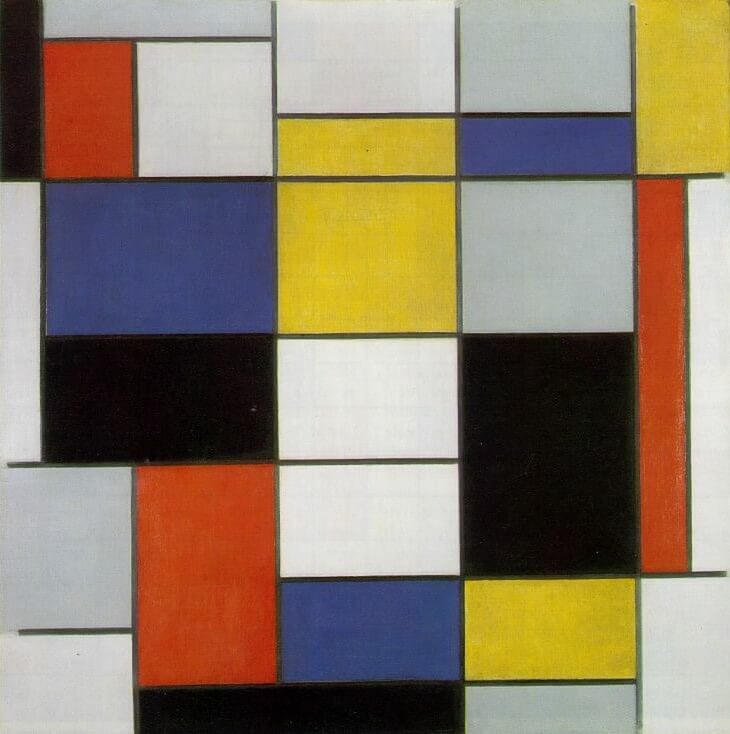 I have loved Piet Mondrian's abstract geometric artwork since I saw it at the Tate Modern when I was young. The bright colours, bold shapes, and geometric design really appeal to my taste. I think I like it as there's an element of pop art about it even though Mondrian was around in the early 1900's, way before pop art came to the scene. Today's design is inspired by Mondrian's abstract geometric 'Neo-Plasticism' work, using primary colours and straight black lines. I've seen this style replicated in nail art before, but to be honest I've been a bit scared to try it out. I wanted to attempt the style, but I knew I would be unhappy if I didn't get it spot on, and as Mondrian was so precise with his work that would be quite a challenge! Eventually I plucked up the courage and, using Composition No.II as a guide, I set to work. I toyed with a couple of methods of creating this design including using striping tape, but in the end decided to go free hand. I started with two coats of Rimmel - White Hot Love* as a base. Once this was dry I drew on the outlines of the boxes and lines with a white Barry M nail art pen. Using the white lines as a template I filled in boxes with O.P.I - Red My Fortune Cookie*, Maybelline - Electric Yellow and Barry M - Damson*. Finally I, very carefully, drew on the black lines and filled in a couple of boxes using a Barry M nail art pen. My lines aren't dead straight but neither are my nails so I think the hand drawn look fits quite well. I didn't want to attempt perfect neatness and just end up with a mess! As my nails are only small I filled in more boxes with colour than Mondrian's pieces usually feature. I wanted to make sure I displayed every colour on each nail so they looked good individually as well as overall. We love artist-inspo nails and tend to get fairly good feedback from our followers. The request for Mondrian nails actually came from one of our Instagram followers, @eleanor_amelia, thank you for giving us that final shove!! Mondrian's artwork is on display at the Tate Modern in London if you want to check him out for yourself! I've never been a fan of Mondrian but this nail art looks great!